President Sata is deeply saddened at the death of legendary football commentator and administrator Mr. Dennis Liwewe, who died in Lusaka today. In his message of condolences to the Liwewe family, President Sata said the late Mr. Liwewe was an icon who revolutionised Zambian football through his commentaries and many administrative roles he played. The President said Mr. Liwewe was a reservoir of knowledge in football and leaves a legacy of great patriotism and passion for sport. “I have known Dennis for many years as a passionate football commentator who helped raise the standards of Zambian football to the level it is today. Dennis has been part of the country’s football journey through the many successes and challenges, and at no time did he drop his chin,” the President said. The Head of State said Mr. Liwewe was also a vibrant journalist who discharged his duties professionally. “It is my strong belief that upcoming leaders in sports can tap some wisdom from the life of this great son of Zambia. His passing is a great loss not only to the Liwewe family but to Zambia and Africa as a whole,” the President said. ati the president said, when we all know it was george chellah. Ba Sata limbi tabeshibe nokwishiba, baletonyafye ililenda. bakeshiba next week when those electrical impulses from his ear sensors finally reach the processing unit of his brain. Surely, not everything is in the realm of politiking! This is a message of condolences by the Head of State on behalf of the nation. Please……………. I agree. Sometimes we MUST learn to give due where it is. The president has shared his thoughts and at this dark hours this is not about Mr Sata , this is about the late Mr Liwewe. Iwe Zagese!!!! The Presido is soccer fan #1. Bashikulu joins the Zedians in mourning this gallant son of the soil!!! @zagaze, the office of Press Assistant is as old as the Presidency and so must not be anything to be used in cheap politicking at all. I implore you to at least look on the sombre occasion and direct your thoughts towards the commiseration that this occasion demands. am the avenger i told you already, fyonse efyo sata alechita abanakwe naine is what i will be doing in my commentaries to him. pantu mulalaba bwangu sana. I have already paid my respects kuli ba mdala ba liwewe on another blog,which is not tainted by sata a.k.a george chellahs worthless comments. besides i got nothing to prove to any of you!!!!! think what you will, i will also do my own thing. Where is the National mourning? That man achieved more than any of the PF ministers. Sata give us national morning, just 1 week, not more. surely you should be referring to your parents. I join the President and the whole nation in mourning Mr. Denis Liwewe the only self-made journalist, public/human relations guru and incomparable football commentator as well as impressive smartman in dress code I ever knew from the first time I saw and met him in 1962. He was one of the first blacks in Nchanga/Chingola to shift to stay ‘kumayard’ whites only residential area when he worked for Nchanga Drum the fore-runner to the Mining Mirror newspaper. I was a youth and we always looked up to him. May His Soul Rest in Eternal Peace and Rise with the Risen Lord one day! He left everlasting legacy for his children in journalism which became a family trade/skill proficiently for any journalist to admire jealousy-down and certainly emulate and all of us to appreciate. A sad day for Zambia. 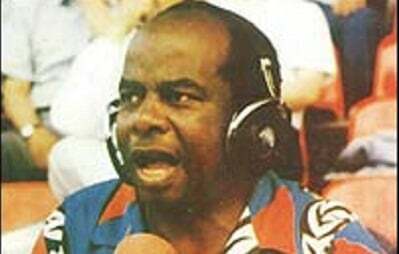 Gone is the legendary football commentator. No one could match the man! We wish a replica could be made in Zambia. They don’t make ’em like him no more! A sad cloud has decended on the skies of Zambia. Dennis Liwewe a comentator of all times is no more. Oh dear Dennis you have walked your walk, you have fought a good and courageous fight and yopu have left a true legacy in the hearts and minds of all soccer loving people in Zambia and beyond. never in my whole 43 years of life have I come across an adent soccer commentator and analyst like you Sir. i will not cry but I will thank God for having given you to Zambia. So long Dennis so long. Rest in peace mwebafyashi. We Mourn with You MCS! A soccer Icon , journalist and galant soldier is no more. As we celebrate 50 years of Independence remember to honour this departed Son of Zambia. Even in his last days he was full of wisdom. So shocking indeed! We thank the almighty God for what he has done to this country especially in the area of football. For those who are still passing comments about the President when he has just expressed his sympathy about the passing on of this legendary commentator, I say there’s time for politics and time to mourn. In Zambia, it is a funeral through and through, for both the living and the dead. Cost of living is on the rise. Crime and road accidents are on the rise. The standard of health care is on the decline. If this president is indeed a remorseful person, it should pain him, which ever way he looks at it. PF need to re-examine its policies and philosophy. things and he never cared…i have reached a point wer i can say any thing about him…and i am not regreating…only God can judge me…. All Tonga are “Indoshi’s”. Crocodiles and cobras that you can never satisfy that blindly support their tribal committee called UPND, *****s.
Peace and let Peace be our way of life. Love & Peace to all living beings my brothers and sisters. Wrong time to be spewing nonsense. May the good LORD bless and comfort the Liwewe family. Both Bembas & Tongas are f.ools in that way,how come you quarrel over two fools that you will not even benefit in? Am a Kaonde but I usually see stupidity in these two tribalistic troublesome tribes. Liwewe Denis papa MHSRIP. luwmi mwane you are are the 1s t***** in the world. Rest in Peace Mr Liwewe. You are part of the fibre that has weaved Zambian Football to what it is today. I’m pleased that You witnessed Zambia become African Kings, before Your passing. Condolences to the Liwewe family, & our prayers are with You, during this sad time. In many a country we see leaders standing up and personally expressing their condolences for a great one of their own, that has fallen. Not through a hollow script that has impersonal connotations. Apart from swearing in ceremonies, the President rules only through indirect statements – its annoying and disrespectful of your people, if you asked me. i doubt that the message came from Sata. How come he is always quiet over car bus track accident victims? how come he never sent a message of condelence to the Barotse Queen? in any case we mourne for Dennis. he was a might son of Zambia/Malawi and Africa.